You may want to discuss with your students the role of variation in nature. Mangrove swamps typically experience great variation in water level and in the saltiness of the water, based on the level of the tide. How does such a variable environment affect the evolution and functioning of the plants that live here? Panorama Viewing: Click the "View Panorama" button to see an interactive panorama. Click and drag your mouse in any direction to view other parts of the scene; press the Shift key to zoom in to see details and press Ctrl to zoom out. We recommend using the Deval VR viewer for seeing panoramas that do NOT have sound and the QuickTime viewer for panoramas WITH sound. 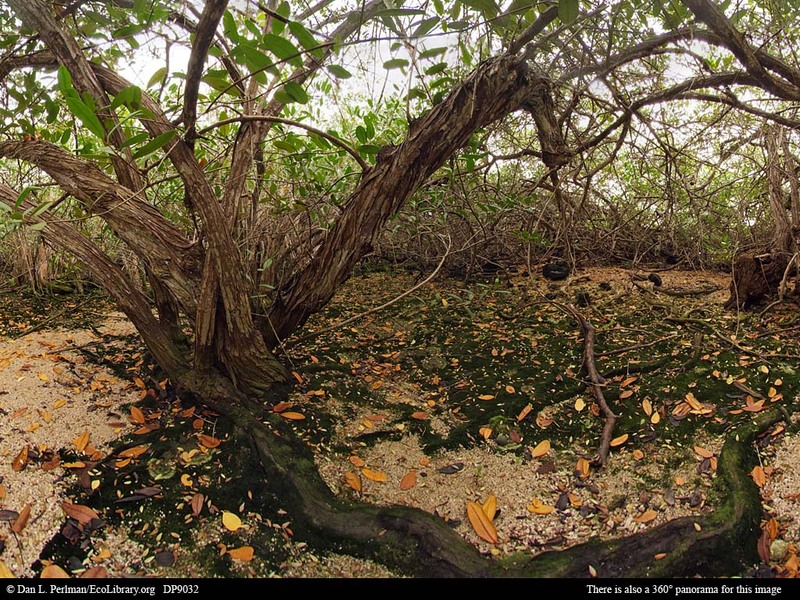 Mangrove swamps are very difficult habitats in which to live. Existing at the interface between land and ocean, they experience drastically changing conditions with water levels, oxygen levels, and salinity levels throughout the day as tides move in and out. Very few tree species are able to live under such a wide range of physical and chemical conditions, but the few that are able to survive here -- such as the white mangroves, Laguncularia racemosa, seen here -- flourish with little competition. Compare this panorama with the Arid Zone and Scalesia Forest panoramas from the same island.